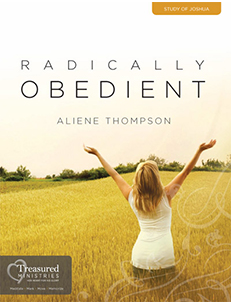 I recently completed Radical Obedience: The Joshua Study for the second time. To say this study is life-changing would be a stark understatement. This Scripture-saturated 9 week study by Aliene Thompson dramatically impacted me the first time through three years ago. Going through it again only furthered its impact and has left me changed for the better. Aliene has brilliantly written this study in such a way that the Word truly speaks for itself. Nothing is conjured. Rather, it guides the reader in learning to hear the Lord’s voice through the whole cannon of Scripture. Radically Obedient brought this truth to new light in my life. As I went through the Scriptures, the Lord spoke often to my heart. He exposed root issues in my life, showed me areas I needed to confess and grow in, and gave me a deeper perspective of His magnificent grace. I was stretched as a woman, wife, mother, daughter, Christ-follower and friend. Though my life circumstances are far different now than my first time through this study, He worked through it to profoundly impact me today. Fresh manna. PLEASE! Get this study! Not because Aliene has written it so well (though she has) nor because Joshua is an amazing book of the Bible (though it is). Get this study because the Word of God is its sole focus. His Word IS living and active! Allow it to penetrate your heart and change you for the better. No matter your circumstances or season, there are treasures to be found within its pages.